Whenever Steak and I visit a restaurant or cafe in Oxford Circus, I find myself trapped in a perpetual state of anxiety. Not because I suffer from agoraphobia or anthropophobia, but because I know that at any point during the trip, Steak could suddenly decide to veer into a retail shop. Too often have I geared myself up to enjoy a hearty meal, only to end up eating my own brain as Steak browses the makeup aisle at Superdrug, or the dwarf-section at New Look, taking no consideration for the fact that I may actually end up eating the caramel-coloured concealers if she takes any longer. With this shopaphobic problem of mine in mind, I knew that I would have to have an effective battle plan when visiting Chi Kitchen. Located within the Debenhams store on Oxford Street, this Pan-Asian restaurant was created as an exclusive brand for the popular department store and its die-hard customers, and certainly posed a challenge in terms of getting a meal without having to endure an eternity of shopping. After considering various options – including slipping Steak a horse tranquilliser or tunneling into the restaurant, I decided to utilise the old-fashioned method of dragging Steak through the store as her eyes darted back and forth at the sale signs littered around her. Never in my life have I wrestled a bear away from a pot of honey, but I can now say that I’ve come pretty close. All the meat served here is certified halal. Alcohol is served on the premises. If you make a booking via Open Table, you can get 50% off your bill when ordering a minimum of two starters and two mains. This offer is applicable for a booking of up to six people. The menu at Chi Kitchen is influenced by Chinese, Vietnamese, Malaysian, Korean, Thai and Japanese cuisine, and as such, it boasts a fantastic variety of items. In fact, we were so spoilt for choice and enjoyed our first meal so much, that we returned just a few weeks later to polish off more of the menu. The wagyu beef kushiyaki was the first starter we sampled on our initial visit, and consisted of two skewers of quality wagyu beef, drizzled with a sweet soy sauce. As per usual, the beef arrived medium to medium well instead of my medium rare order, and though fairly tender, the beef itself did not possess quite as much flavour as I was expecting. Instead, our tastebuds were appeased by the accompanying sauce, which added a gentle sweetness to the beef. Equally pleasing were the Korean chicken wings, which were soft, sticky, and moist, delivering a moderately sweet touch of Korean BBQ sauce. The basket of chicken and prawn dim sum on the other hand, was grossly underwhelming. Whilst the casing was soft and firm, the helping of prawn and chicken within was surprisingly bland and unexciting. Given that I’d normally sell my kneecap for a basket of dim sum, (and given the plummeting value of the pound, I may actually have to), it feels strange to say that I’d advise you avoid Chi Kitchen’s dim sum altogether. Thankfully, the disappointing dim sum was completely offset by the rather phenomenal popcorn shrimp. 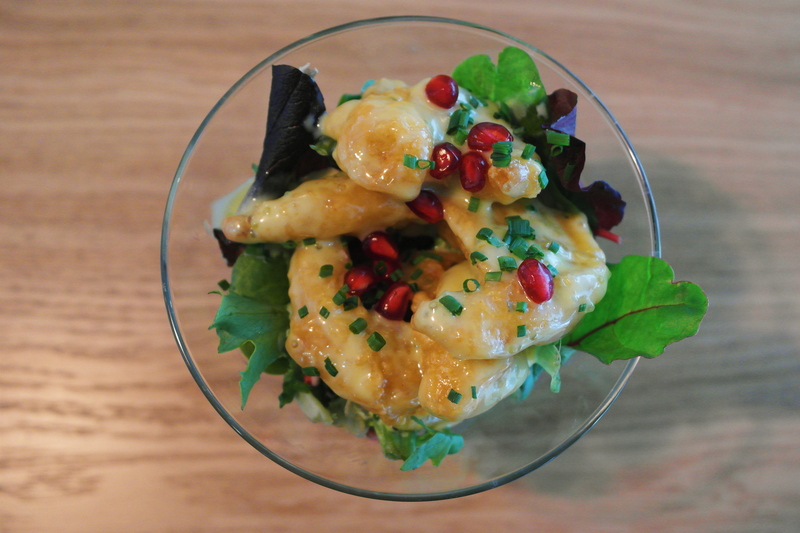 Gracefully presented in a tall glass stand, the soft, well-cooked shrimp were encased within a crispy coat, smothered in a smooth and creamy blend of wasabi mayonnaise, sat upon a bed of rocket and baby spinach, and garnished with a handful of pomegranate seeds. Surprisingly, each piece of shrimp delivered a sweet and mellow flavour, with no sign of the brutal kick normally associated with wasabi. As the creamy texture of the sauce oozed across the palate and wrapped around the crispy coat of the shrimp, the tastebuds were greeted by refreshing, periodic bursts of pomegranate, resulting in a gustatory experience that was nothing short of heavenly. Put simply, this is one starter that you simply cannot fail to order. When it came to main courses, my first dish of choice was the Korean steak, which consisted of tender and succulent slices of sirloin steak, sat upon a bed of chive-infused mash potato. The steak had been overcooked once again – but this time only just, to medium instead of medium-rare, and possessed a good amount of flavour with reasonable depth. The flavours were further enhanced by the generous slather of bulgogi sauce, which delivered a pleasantly strong umami touch to the tongue. However, the accompanying mash was rather thin in consistency, and needed a much stronger essence of chives to impress my stern tastebuds – which, sadly, it didn’t. Steak meanwhile, had opted for the sambal prawns, which were well-cooked, soft, and possessed a slightly spicy touch. The accompanying stir-fried vegetables provided a pleasantly contrasting crunch and added a subtle zest to the dish, and both components worked well with the soft and aromatic jasmine rice. Fast forward once again to our second visit, and I decided to break the mould of meat by ordering the steamed seabass. This hearty piece of fish came seasoned with sea salt, pepper and chilli seeds, and had been cooked in a lime and seafood sauce. The result was a strong, sharp, and salty citrus flavour that stung the tastebuds in a most exquisite fashion. This was shortly followed by a subtle, spicy afterkick that seemingly sprung from nowhere, cutting through both the fish and the sharpness of the lime. It was a fantastic combination of flavours that made the soft seabass and its crispy skin an absolute delight to eat. Steak had opted for the green chicken curry on our second visit, and we both found it to be smooth and exceptionally creamy, with a strong, deep flavour that was wonderfully aromatic. Whilst visually, it may look rather dull and unremarkable, remember – it’s what’s on the inside that counts. At least – that’s what my mother says to reassure me. Of course, no meal during cutting season is complete without a healthy dosage of green tea, and so, taking this principle into account and skewing it completely, we ordered a green tea crème brulee. True to its nature, it possessed a crispy, crystallised surface, with a soft, smooth and creamy pudding below. However, whilst the pudding delivered a strong green tea flavour, the accompanying vanilla ice cream was – rather strangely, completely plain and bland. Certainly, a scoop of mango or coconut ice cream would have been better placed. We were also a little puzzled by the cornflake pieces. Not only were their crunchy textures a little redundant given the crystallised surface of the crème brulee, but their very presence seemed completely out of place with the rest of the dessert. One can only presume that the chef had had a lie-in and accidentally spilt his breakfast into our bowl. On our first visit, the wagyu kushiyaki cost £8.95, the dim sum cost £6.25, the Korean steak cost £20, and the sambal prawns cost £15. This amounted to a total bill of £51, and after applying our “50%-off” OpenTable offer, the bill was reduced to £28, including service. On our second visit, the popcorn shrimp cost £6.95, the chicken wings cost £6.50, the seabass cost £15.95, and the green curry cost £14.95 (including rice), whilst the green tea crème brulee came in at £6.95, amounting to a total bill of £51.30. This was again reduced with the OpenTable offer. Generally, breakfast items cost around £5, starters range from £6 to £15, mains from £12 to £20, and desserts cost around £5 to £7. Whilst consideration has to be given to the fact that Chi Kitchen is situated in the middle of Oxford Street, I do feel that the undiscounted prices are just a little bit high relative to what you get. That said, if you don’t order a large number of items like we did, you shouldn’t feel too big a blow to your bank balance. As many of you may know, the word “chi” means “energy” in Chinese, and the staff members at Chi Kitchen certainly seem to have a lot of it. Service is polite, courteous, and fantastically efficient – if not a little too much so. Indeed, on our first visit, the team of waiters and waitresses looking after us brought all our dishes out in one go, (rather than staggering starters and mains), which made for nothing short of a hectic nightmare. As I furiously tried to photograph each dish before they became stone cold, Steak simply stared blankly at the table, unsure of where to begin first. Our dim sum also arrived after our main courses, and rather than leaving the lid on the basket to keep them warm, our waitress promptly ran away with it, forcing us to frantically dive into the steamed dumplings whilst the “steamed” portion still remained. It was certainly no way to enjoy a relaxing meal, and somewhat detracted from the experience. Thankfully, normality was restored on our second visit, ensuring that Chi Kitchen only lose a half mark for their 2Fast2Furious remake. Despite being rather small in size, the restaurant remains remarkably spacious and open, with a simple decor composed of light wood and stone tiles, and a touch of teal in the form of comfortable leather booths. The dining space is also basked in a mixture of soft, dim indoor lighting and the crisp natural daylight that filters in through the glass exterior of the building. As noted earlier, the restaurant is located on the ground floor of the Debenhams store on Oxford Street, and can be accessed by walking to the far left corner at the back of the store, or directly via a rear entrance behind the store. The nearest station is Bond Street, and of course, public transport is advised, given that you’re more likely to find a unicorn than you are a parking space. Visiting Chi Kitchen certainly feels a little odd at first, given that you have to stroll through a department store to get there, but once inside, it’s very easy to get comfortable and feel at ease. The dining environment at Chi Kitchen is really a rather casual one, so rest assured, you’ll be able to enjoy a very laid-back meal with your dining companions. Like many a Pan-Asian restaurant in the nation’s capital, Chi Kitchen is a far cry from being a perfect eatery. Indeed, when it comes to the food alone, there are numerous niggles and flaws and a vast amount of room for improvement – something that is to be expected of a restaurant that tries to dabble with several different cuisines all at once. But, relative to other Pan-Asian eateries, Chi Kitchen actually does well to get a fair amount right. Whilst certain items fail to impress, those that are good, are decidedly great, and with a little polishing, Chi Kitchen could go a long way towards achieving its full potential. And, whilst I must warn my fellow shopaphobes to take caution when visiting this retail-bound restaurant, I must admit that the horrors of a tortuous shopping spree may just be worth it.